verdigris hall*: Lace for Men? Why Not. I created a birthday card last night for another male relative of mine. 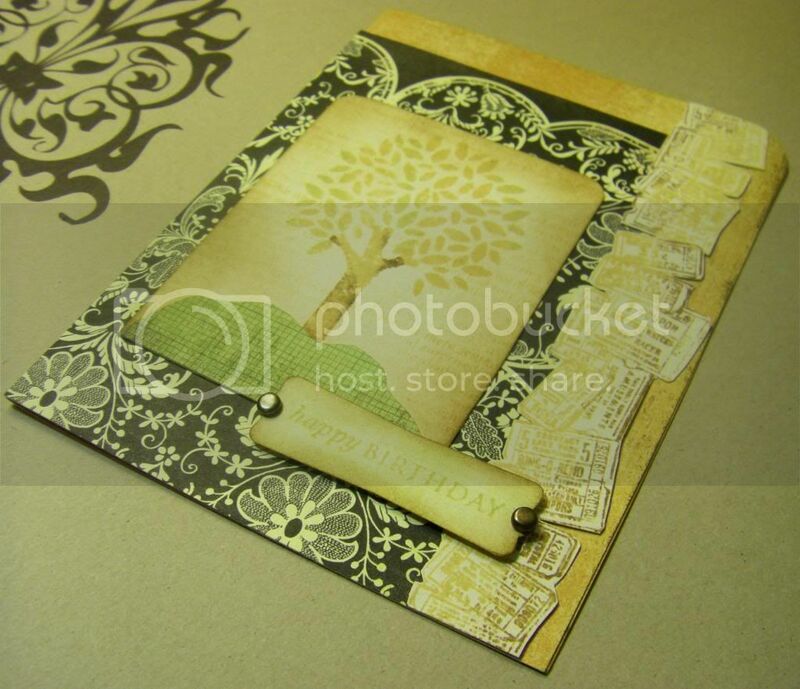 In January I took a Basic Grey card class at a local scrapbooking store using the Origins line. To be honest at first I was skeptical about the line, but within a few minutes I was sold...really sold on the glorious yellows, greens, browns and black. This was a set which was gender neutral I suddenly realized with giddiness. For all those doubters saying: "But there is floral and lace" not to worry! I used one of the cards I made in the class as a base for this particular card (I haven't used any of the cards exactly as they were designed by Basic Grey as I feel I need to customize them, but they make an excellent jumping off point) which used the black lace patterned paper and it works for a man (hetrosexual no less!). It is all about the images and accessories. 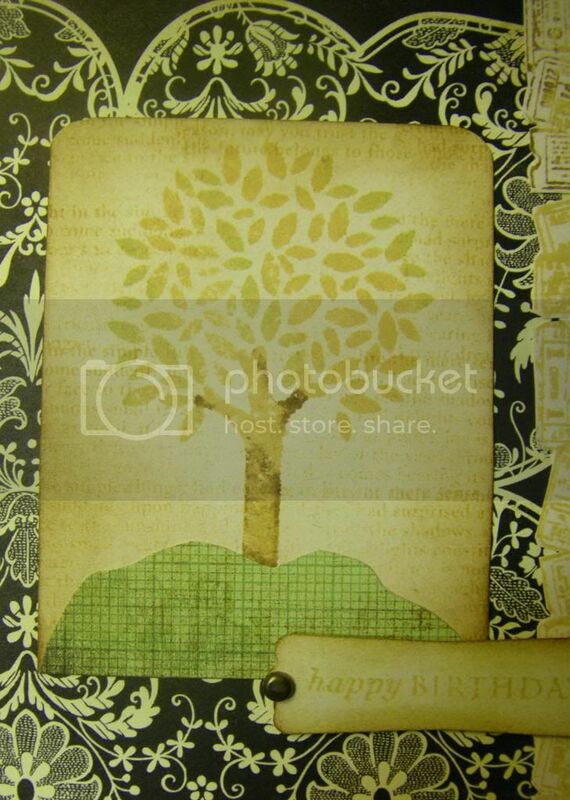 I went with a lovely tree by Papertrey Ink and the tickets are from Tim Holtz. 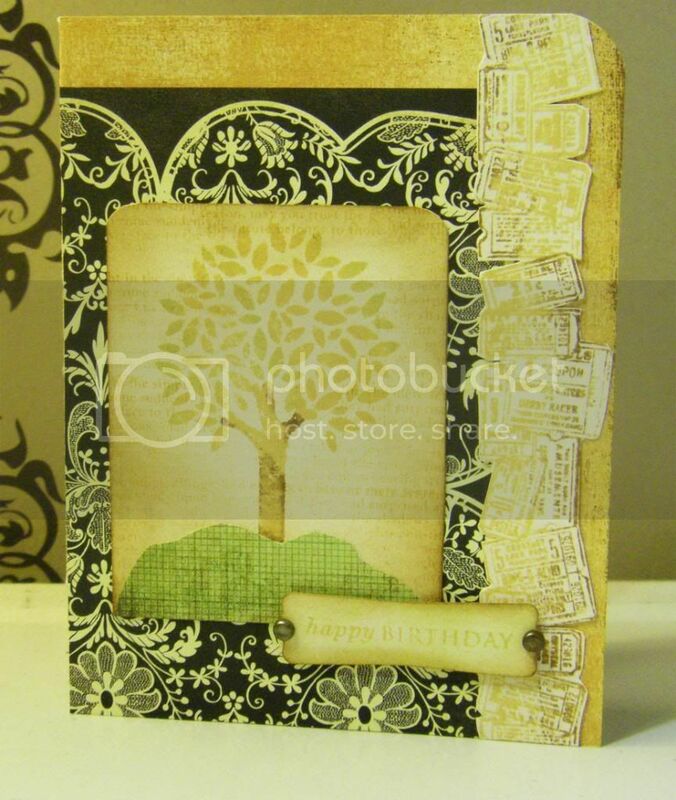 Add a little Distress Ink, some text background stamping and mini brads and what man can claim it is girlie? I hope you enjoyed this card. My thanks for checking out this lacy bad-boy. Punch: Modern Label, Stampin' Up! I love this card! You have really taken Basic Grey to the next level! Fabulous!